After two consecutive defeats in the Greek Cup final, PAOK changed page and everything suggested that the club were by then ready to claim their first piece of silverware. Les Shannon had been appointed in February 1971, taking over the baton from Ivica Horvat who was fired after the goalless draw with Olympiacos at Toumba Stadium and the interim coaching spell of Giorgos Chasiotis. Although PAOK’s levels of morale were low due to their disappointing run in the 1970-71 season, Les Shannon worked hard to propel his troops towards the Greek Cup. Securing qualification over Kallithea in Athens was not hard, however PAOK’s mettle was really tested in the Toumba encounter against Panathinaikos. The “Greens” took a 2-0 lead, but PAOK turned the tie around eventually prevailing 3-2. In the semi-final against AEK, the “Double-Headed Eagle” won on the same scoreline (3-2), but with less drama. AEK scored the opener, but were already losing 2-1 before the end of the first half. The Greek Cup final of 1970-71 at KaraIskakis Stadium was Les Shannon’s first experience in the competition. Olympiacos took a 2-0 lead in the first half, Stavros Sarafis reduced distances and put PAOK back in the game. The “Double-Headed Eagle” however missed quite a few chances for the equalizer, giving Olympiacos the opportunity to make it 3-1 in the 82nd minute through Pampoulis. By summer 1971, Les Shannon had already come to grips with the realities and peculiarities of Greek football. He made the necessary adjustments to the squad, providing solutions for their weak spots. Kostas Iosifidis was an instant hit at Toumba and a regular in the line-ups, while Koulis Apostolidis’ return from his USA studies provided the Englishman with yet another quality solution that PAOK lacked in the previous six years. That season’s transfers included Paraschos, Tsakiropoulos and Angelos Anastasiadis, who featured in eight friendly encounters that summer and then went on to play for PAOK youth sides. The fans’ instinct was spot on right from the start. PAOK had showcased their quality during the summer friendlies. On 3 September 1971, a new attendance record was registered at Toumba Stadium as 38.013 spectators flocked to watch PAOK take on Universidad Católica de Chile. The “Double-Headed Eagle” prevailed 4-0 (19’ Koudas, 46’ Aslanidis, 69’, 75’ Apostolidis). Two days earlier, on the 1st of September, PAOK had played their opening encounter in the Greek Cup competition, comfortably dispatching Finikas Polychini 5-1. The Greek Cup draw procedures were kind to PAOK, as they didn’t need to move from Thessaloniki and ended up playing all their Cup matches leading up to the final in their town. In the last 16 stage and in the semi-finals, the “Double-Headed Eagle” were paired with lower tier clubs. In the quarter-finals, they took their revenge from Aris, eliminating them at Charilaou Stadium with a 2-1 victory. Due to incidents during that match, the referee had to blow the final whistle ahead of time. As a consequence, Aris players Spyridon and Sidiropoulos were heavily punished at first instance (13 months and 5 months incarceration respectively), but their bans were overturned on appeal. PAOK eliminated Pierikos, Aias Salamina, Aris and progressed to the final with their semi-final victory over Lamia. Since the previous season, PAOK had insisted on the appointment of a neutral ground to host the final, as the 1970-71 Greek Cup showdown against Olympiacos had been held at Georgios Karaiskakis stadium. PAOK would face Panathinaikos this time around -the Greens had prevailed over Panionios in the semis-, but the final was played once again in Athens, at the “neutral” ground of Karaiskakis and not at Leoforos. So PAOK returned to the familiar yet inhospitable surroundings of Karaiskakis, far more experienced and readier to claim the Cup title. The players had 10.000 fans on their side and they vowed that it was about time to return with the trophy at Thessaloniki. Panathinaikos head coach Ferenc Puskás spoke highly of PAOK’s mature game and the fans of the “Double-Headed Eagle” started celebrations in Thessaloniki. 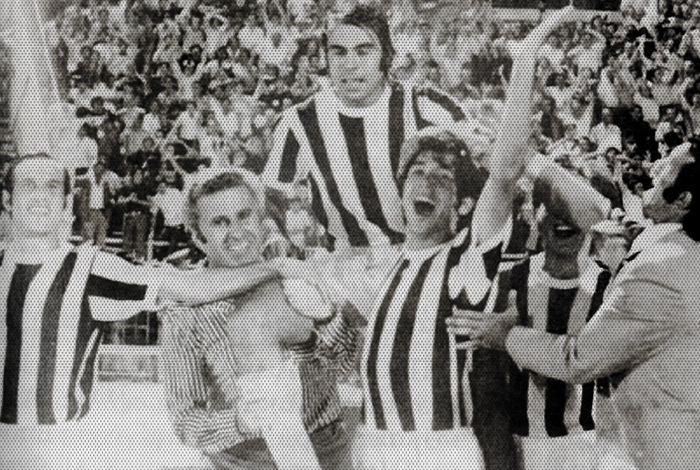 As described in a newspaper report, “PAOK’s triumph was wildly celebrated. Fans took to the streets, would jump with their clothes in the sea and the White Tower fountains, the city was all lit, church bells were ringing, there were chants, songs, tears, embraces, car horns, PAOK banners, all pieces of the triumph puzzle. Right after the final whistle, everyone who was watching the match headed towards the centre of Thessaloniki, using any means available: motorcycles, tricycles, trucks, buses and mainly small cars, all causing traffic congestion and big noise with their horns, trying to make their way to the White Tower. The younger fans would sing “here-there, here-there, we brought the Cup to the White Tower”. On Thursday 6 July 1972, despite the heat wave in Thessaloniki, at least 2.500 cars headed to the airport to welcome the players of PAOK who were bringing back the trophy. At exactly 16:35 it was announced by the airport loudspeakers that the flight had landed and the first cheers of the public were so loud that the players inside the aircraft heard them. A few minutes later, the door opened and Koulis Apostolidis was the first to appear holding the trophy. Giorgos Koudas and Les Shannon had remained in Athens, to catch a flight to England. The PAOK player would undergo a scheduled operation to deal with a chronic shoulder blade injury. After their arrival, the players boarded their bus and the motorcade headed towards PAOK’s headquarters in the city centre. There, fans and team would celebrate once again the Greek Cup triumph, with the trophy providing the backdrop. The employees of the club had put it on the ledge of a window at PAOK offices.